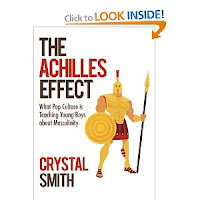 Have you read The Achilles Effect ? I have and I’ll say this: I’ll never look at media the same way again. I thought I was already pretty savvy to the subtle influences of media, but after reading the book, I’m even more acutely aware of the ways in which pop culture defines “male” and “female.” I’m also aware that I’m not going to change the dominant culture, at least not all by myself. So it’s up to me — and you — to counteract the messages our boys are getting from the media. What are some of the things that parents perhaps aren’t even really noticing, as far as media and its potential to influence our our boys? The idea that men have to be very stoic. Don’t show your fear. Don’t show when you’re sad. It’s okay to show anger. I think that’s something that really does affect boys, as they become men. They start to, as men, deny their emotions. They bottle it all up and then it comes out in other ways that are maybe not so healthy. Do you think that talking about gender stereotypes can make a positive difference in their children’s lives? Be aware of the messages that are out there and talk to your kids. Get them discussing it. Ask them questions: What do you think of this portrayal? Why isn’t there a dad in that story? Get that process going and get them thinking about what pop culture is telling them. An issue that has long bothered me about some of the shows that my boys watch is the way the male characters talk to each other. It’s frequently not very nice. There’s a lot of that trash talk going on. There are very few incidences in the media where you see boys or men having a respectful conversation with one another. It really bothers me, the way that sort of language is associated with male characters. It does set the tone for the way male relationships “should be,” this whole idea of competitiveness and dominance. You mentioned competiveness and the dominance. Some will say that is more wired into a male brain than a female brain. What are your thoughts and opinions on that, the nature versus nurture divide? The things that I’ve been reading talk about how early in life the nurture starts towards these gender roles. From the time boys are born, they’re described in different terms. They’re treated differently. They’re handled more, experience more rough housing as kids. They’re wrestled with more. They’re cuddled less. So it’s really hard to decide, is it really nature or is it that they’ve been treated differently? I don’t have a definite answer, but the books that I’ve been reading, like Delusions of Gender and Pink Brain, Blue Brain: How Small Differences Grow Into Troublesome Gaps — And What We Can Do About It by Lise Eliot make it look like nature’s not quite the dominant force a lot of people think it is. What did you think of The Achilles Effect? Fascinating interview. I find that when I was the single parent, I cuddled both of my kids — a boy and a girl. We hugged. We kissed. We talked. We held hands. In high school, my kids were not the kids to shy away from running up to me for hugs. They were not embarrassed by their mom. They just didn’t buy into that. When I see my big boy now, who will be 29 next week, he still gives me a big hug and sloppy kiss. I love that. He will still hold my hand. His wife even thanked me for raising him to be a sensitive guy. He’s a strong boy, for sure. But he’s well-rounded. I think moms do their boys justice to help open their boys’ hearts and minds to be able to express themselves in all ways, not just the ways we think men should express themselves. I know I made a lot of mistakes, but I will stand with you, Jenny, and help make change. I now have a grandson. And his dad is big on the horseplay. But his mom wants him to be a cuddler, too. I’ll help her make sure he knows it’s okay. Aw, thanks Jackie! I think it’s so important that our boys (and girls) know that both rough-housing and cuddling is OK. Personally, I’m partial to cuddling. There’s nothing sweeter than a hug or kiss from one of my guys!